Most local people know Chapel Hill as the steep, narrow road that leads up to the Golf Course, either to play golf, to enjoy some amazing views of Lewes or as a walk over the Downs. However, did you know that cricket was played on the top of the hill before golf and that there was a pub called ‘The Cricketers’ halfway up the hill? And why the name Chapel Hill? What happened to the chapel that gave the road its name? What was Baldy’s pleasure garden and who were the artists James Lambert (senior and junior)? Find out more about the fascinating history of Chapel Hill and the people who lived and worked there at our next meeting. 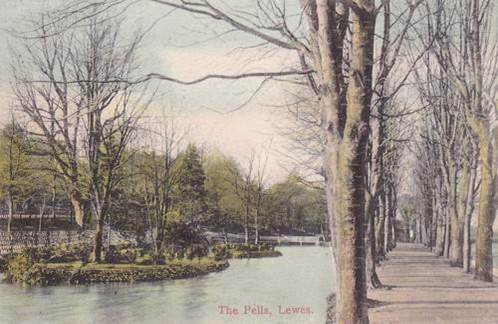 This Edwardian postcard is one of many featuring the Pells. In February 1602/3 a group of properties that had formerly belonged to the fraternity of St Thomas the Martyr in the Cliffe were granted to a group of parish trustees “for the maintenance, reparation and sustentation of the church of St Thomas the Martyr, and the reparations and emendation of all and singular the premises, and for the relief of the poor who shall, from time to time, be inhabitants of the Cliffe aforesaid”. The usual practice was that in every generation a new group of trustees were appointed when the previous group had been reduced to just two survivors. The premises were the half an acre in the Cliffe formerly used as the fair-place there, abutting to the chapel wall, a small piece of marsh land called the Summers Wish in South Malling parish, two houses and a barn in North Street, Cliffe, three houses in South Street, Cliffe, a house in West Street, Cliffe [Cliffe High Street] and three houses nearly adjoining Cliffe church. “But as public endowments and institutions are ever subject to embezzlement and abuse, not only a part of the yearly profits of these lands and tenements was frequently misapplied and withheld, but even a considerable estate nearly lost to the parish for near a century. Simon Edmonds, one of feoffees of 1667, had the audacity to settle on his daughter, at the time of her marriage, all the tenements that belonged to the parish in South Street, and the inhabitants the deplorable supineness or ignorance to submit to a wrong of such magnitude and publicity. After this fraudulent alienation, those tenements continued in the posterity of Edmonds or their assigns till about the year 1770, Mr Francis Wheeler, one of the coroners for the county of Sussex, got some intimation of the long dormant title of the parish to the usurped tenements, and with that public spirit which eminently distinguished him through life, recovered them at trifling expense to the parish. Nor was that the only good office of the like nature, for which the town is indebted to the laudable exertions of Mr Wheeler. The office of churchwarden had for twenty nine years successive been usurped by Andrew Tasker, hat-maker, who never, during that time, accounted for the issues of the several lands and tenements belonging to the parish. This Tasker was one of those forward, oily knaves, who are the bane of any place where they can creep into authority: and Thomas Baldy, china-man, whom he contrived to keep in office with himself for the last eighteen years of the aforesaid term, was an indolent, besotted man, and a fit instrument for his artful colleague. At length however, Mr Wheeler, Mr Michael Naish, wool-stapler, and other respectable inhabitants of the Cliff, indignant at this official usurpation and embezzlement, called the churchwardens to account; and with the allowance of every disbursement, fair or unfair, which they could state, it appeared they still owed the parish no less than five hundred and fifty two pounds, eleven shillings and tenpence. One hundred and fifty years ago, on 24 September 1863, at a Town Meeting, the inhabitants of an extended borough of Lewes forwarded a letter to Count Wladyslaw Czartoryski in Paris, expressing support to the people of Poland, in their latest uprising against Russian oppression. Revolutionary conspiracies, culminating in the January 1863 uprising, were the result of decades of Russian control of the judiciary, police, church, education and administration, and brutal suppression of demonstrations. Peasant unease over serf emancipation, combined with the decision to conscript Poles into the Tsarist army, was the final straw. The Sussex Advertiser had given notice of the meeting, called by the High Constable, “… to have the opportunity of expressing sympathy with the sufferings of Poles”. Addressing the gathering was a Mr Zaba, a representative of Polish exiles in Paris who had been for some 30 years calling for European nations to intervene on behalf of the Poles. Similar meetings had been taking place in towns across England. In northern cities, workers’ representatives were most agitated. In London several pro-Polish organisations were formed. The Times carried regular reports of the fighting in Russian-held territories of Poland, with strongly-worded leader articles. In Parliamentary debates MPs called for government action – other than diplomatic notes. In spite of personal contacts with the Paris exiles, the prime minister and foreign secretary were wary of undertaking any action “not in British interests”, not wanting, in Palmerston’s words, “to disturb the peace of Europe”. And Queen Victoria was adamant that nothing should be done. But popular feelings were anti-Russian following the Crimean War. Finland had been annexed by Russia in 1809 and Finnish prisoners had spent several years in Lewes. Many townspeople who had hosted officers in their homes were aware of Russian oppression. Poland’s fate was worse. By 1797 it had ceased to exist, partitioned between Austria, Prussia and Russia. An earlier uprising by the Poles had taken place in November 1830, and reprisals were brutal. Many participants who avoided being transported to Siberia escaped into exile in Paris, where they began diplomatic activities on behalf of Poland. Not to be outdone, on Nov. 5 that year, Borough Bonfire Society created a grand tableau. The Sussex Express reporter described how, under a banner inscribed with the words ‘Liberty to Poland’, Poland was represented in the act of breaking her chains, and with them flogging two effigies representing the Tsar and General Muraviev (sent in to deal with the uprising). General Muraviev was later thrown into the fire, while the figure of the Tsar, stuffed full of fireworks, “went off beautifully”. 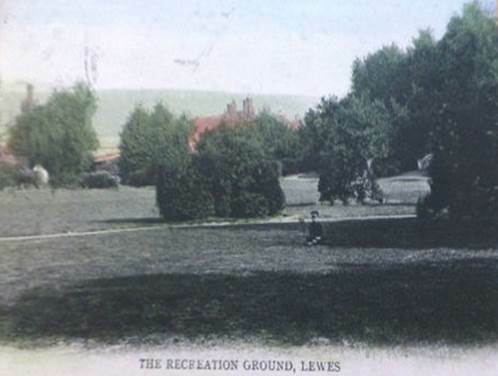 John Davey suggests this picture of “The Recreation Ground, Lewes”, dating from around 1910, could be of The Paddock, with the tower of St John-sub-Castro visible above the trees and the rising ground towards St Anne’s Hill on the right. Fiona Marsden agrees that the picture of the Recreation Ground in the Bulletin shows what is now known as the Paddock recreation ground. She notes that she has come across other post cards of it while assembling images of the Pells recreation ground, as the children’s playground was once known. However, Brian Beck disagrees. He notes that his 1911 O.S. map shows the area next to the Pells swimming pool designated as ‘Recreation Ground’ and thinks this is the area shown. The clue is the castle view showing the two towers with Downs in the background. The Lewes branch of CPRE Sussex will be showing Ian Everest’s remarkable film ‘A Sussex Farm in the Fifties’ at its meeting in the King’s Church Building, 3 Brooks Road, at 7.30 p.m. on Wednesday 9 October. The film shows the annual cycle of activities on a Downland farm at Bishopstone, near Newhaven, and illustrates just how much life on the farm has changed during many of our lifetimes. All are welcome and there is no entry charge. Light refreshments will be available. Please see the notice below about the forthcoming conference ‘Life in the Priory’ being arranged by Sussex Downs College at their premises on Saturday 19 October from 10 a.m. to 4.30 p.m. There are six talks in all, arranged by the Lewes Priory Trust, on different themes relating to the institution. Advance booking is required.